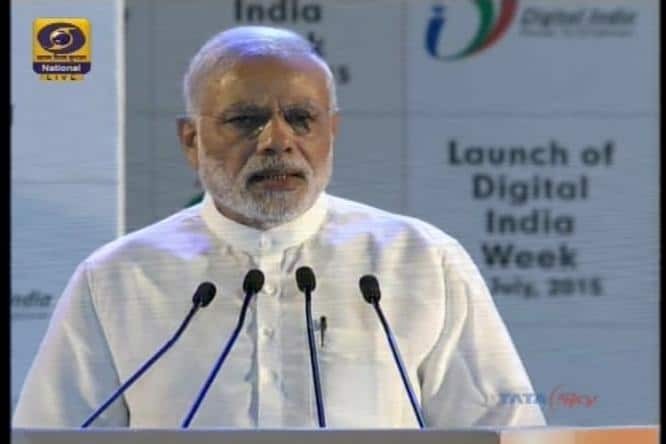 Prime Minister Narendra Modi on Wednesday launched the super awaited Digital India Campaign in New Delhi with a view to empower the people of the country through the program. Digital India aims to transform the country into a digitally empowered knowledge economy.PM Modi said the project will provide employment to 18 lakh people.The prime minister also unveiled a logo for Digital India. Modi announces that Government will give all the necessary support to the youths for start-ups. This will give a huge pump to the emerging startups of the country. Soon e-governance will be transform into m-governance. Digital India will transform the entire nation; dreams of millions of Indians will come true. The chairman of Reliance Industry Limited Anil Ambani said “We commit nearly Rs 10,000 crores to push digital, cloud and telecom space”. Bharti Group chairman Sunil Mittal said “we are committed to invest Rs 1 lakh crores in next five years in digital space”. Wipro Chairman Azim Premji said “The vision of PM for digital India is a very powerful one. It is a first step forward to empower citizens with technology”. Tata Group chairman Cyrus Mistry said “Tata Group will hire 60,000 IT professionals this year”. The launch is attended by nearly 10,000 guests including top business leaders including RIL chairman Mukesh Ambani, Tata Group CEO Cyrus Mistry, Wipro chief Azim Premji and many others.